One of the best long distance trails in the world! The Pembrokeshire Coast Path National Trail hugs the coastline for 186 miles or 299km of some of the most breathtaking coastal scenery in Britain. From St Dogmaels in the north to Amroth in the south, the trail covers almost every kind of maritime landscape from steep limestone cliffs, undulating red sandstone bays, volcanic headlands, beaches, estuaries and flooded glacial valleys. 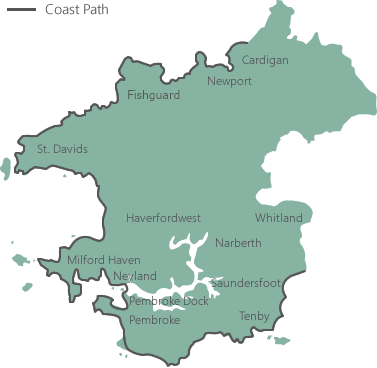 Lying almost entirely within the Pembrokeshire Coast National Park, the trail displays an array of coastal flowers and bird life, as well as evidence of human activity from Neolithic times to the present. The Pembrokeshire Coast Path is the best walk I’ve done - ever! Completing the Coast Path in one go, taking on average between 10 to 15 days, is quite an undertaking. The ascents and descent are said to be the equivalent of climbing Mount Everest – 35,000 feet! Most visitors walk a short section at a time, adding a piece to the jigsaw each time they visit and make good use of the coastal bus service, which serves the rural communities and coast path walkers. Use the map below to navigate through our suggested coast path stages comprising of 15 one day walks. Total rise and fall over entire length of path is approx 35,000 feet - that's as high as Everest!